These animals have a incredible capacity to survive in desert conditions. They fill the Kalaharis if they were meant to be the great Artist's desert paintings in a landscape where few other antelopes would dare to tread. By wonderful design, their blood vessels ensure that the gemsbok have the capacity to cool its blood when passing its nose, from which it enters the brain. They thus flourish in an scorching African environment where other animals would definitely be dead in a day. It uses its hooves for digging, finding water or water-bearing roots underground. The well known picture of some gemsbok wandering on the top of a dune with heat waves blurring the scenes in between, add some spice to a harsh part of the South African landscape. The gemsbok is able to defend itself gallantly with those sharp horns. 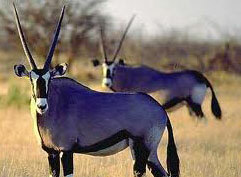 Many a tale is told about the gemsbok, deflecting dangerous objects with those horns or using it as a lance in combat.